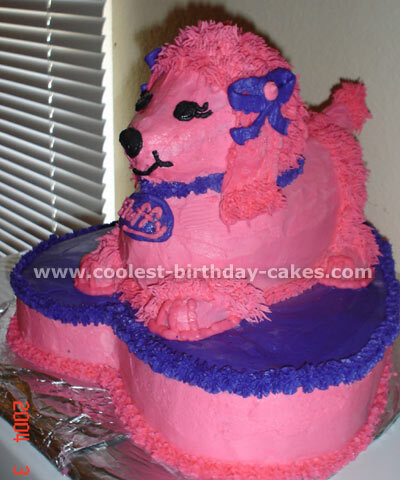 After deciding to have a ‘Pink Poodle’ themed birthday for my daughter’s 2nd birthday I was very disappointed with the lack of cute doggie cake recipes. I decided to just make a two tier cake. I used a 10 inch cake pan for the bottom layer and set a 6 inch cake on top. I set the six inch off center so as to set the ‘Kissing poodles’ on the bottom with room. I purchased the poodles (which are salt and pepper shakers) online as well as the Eiffel Tower tea light holder. It was really easy. No patterns required. I used a basic butter cream icing recipe. It was simple to do and quite a hit! The cake recipe was a basic cake recipe. No bells or whistles. I hope this inspires. I made this cake for my daughter’s 5th birthday. 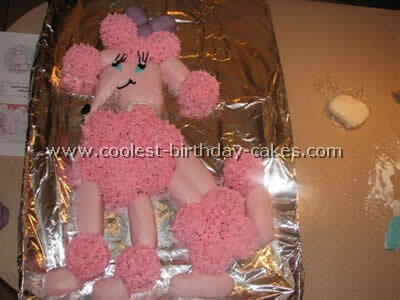 She wanted a pink poodle party with a cake shaped like a poodle. 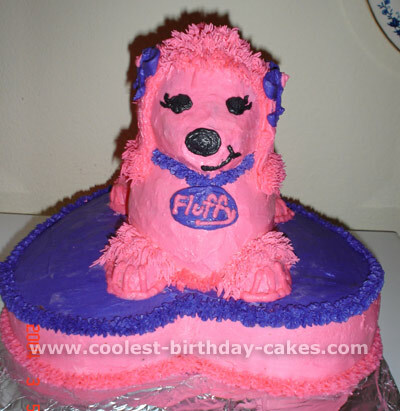 We could not find a bakery with anything she liked so I decided to try coming up with one of my own Pink Poodle doggie cake recipes. This is my first ‘shaped’ cake and my first experience with rolled fondant. I would shape the nose a little different next time but otherwise I think it ended up great. 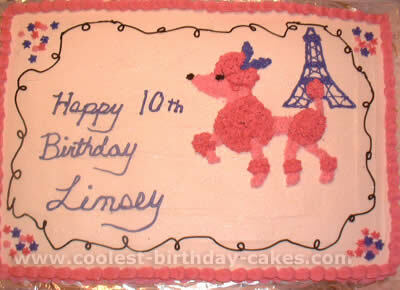 I used cupcakes and piped frosting (just bought ten strawberries) for the fluffy part of the poodle. I crumb coated Twinkies in the same strawberry frosting and covered them in pink tinted fondant for the shaved (or smooth) parts of the poodle. The bow is made from half Twinkies with purple-tinted fondant. The blue and white of the eye is also fondant. The black on the eye and nose is piped frosting. The collar is also made from fondant with the tag part dusted in granulated sugar to add some ‘sparkle’. This was so much fun to make. My daughter and everyone else at the party loved it. For my daughter’s 1st birthday we decided on the pink poodle theme because she loves dogs. Since her birthday is the same week as Christmas, I baked and decorated the cake a week ahead, froze it, and thawed it the morning of her party. I used two cake mixes, baking one in a 9×11 pan and the other in a Wilton Playful Puppy pan. I made three batches of homemade buttercream frosting, and tinted two batches using Wilton coloring paste – two shades of pink (I was aiming for light pink but used too much paste and got very HOT pink! ), black, and a tiny bit of red. I trimmed the bottom layer to roughly the same shape as the puppy cake, leaving the bottom between the feet straight. I frosted the bottom layer white, set the puppy cake on top, and filled in any gaps with frosting. From there I decorated the puppy using star tips and outline tips. For the curly areas I used a large star tip and twisted large blobs of frosting until the areas were built up to look fluffy. I dipped my finger in cornstarch and smoothed out the white areas, the nose and the tongue. I piped large stars around the base of the cake and pressed black and white gingham bows onto the ears before the frosting was set. 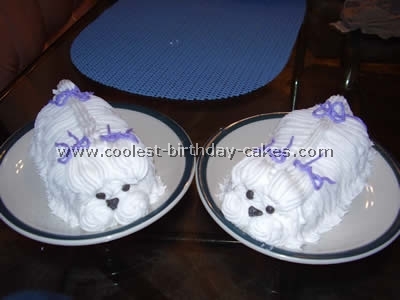 Good luck with your own cool doggie cake recipes! 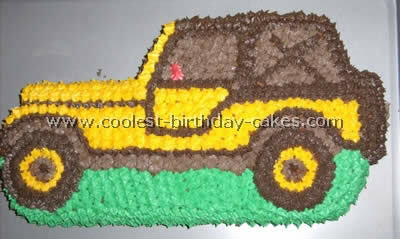 This was made with butter cream frosting. 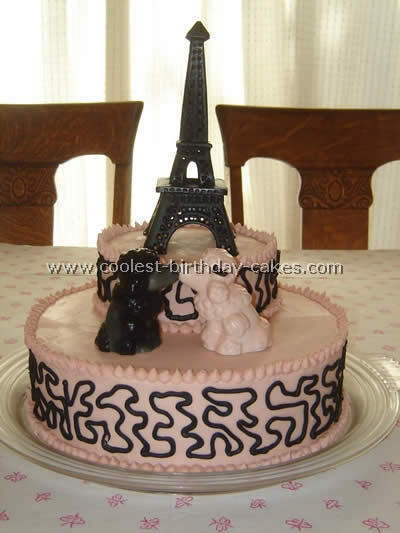 I had to free hand the poodle and the Eiffel Tower. 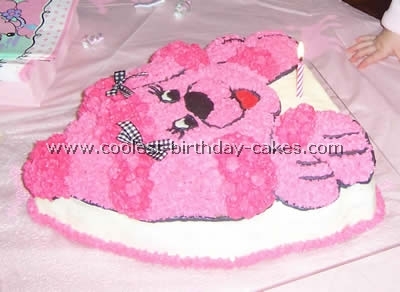 First I sketched the poodle on the cake with a toothpick, then started with dark pink circles and connected them with the light pink frosting. This poodle cake was made for my friend’s daughter. She requested a pink poodle. The base is a 10 in. heart shaped pan. The poodle was made from the 3D rubber duck pan. I added the paws with left over cake that I molded by hand and then iced over. The tail is done the same way. The tail needs to be held on with a small dowel inserted into the tail and then into the dog birthday cake (this prevents it from falling off). The icing used for this dog birthday cake was the good old Butter cream recipe. I used tip # 233 for the fur and piped in the rest with tip # 4. The dog birthday cake collar is done with tip #16. Have fun with your own doggie cake recipes!